A young farmer's son from New Zealand finds himself in exciting and sometimes frightening situations in the far off jungles and cities of Asia. His diverse travels take him to the slums and red light districts of Asia's mega cities, remote islands of the Pacific, and the world's most modern cities. He describes the thrill and excitement of hearing God's voice, the miracle of leading lost tribes to Christ, and discipling the nations. Kel's story reveals what a modern missionary's life is like, both the fun and the challenges of discipleship in the 21st century. 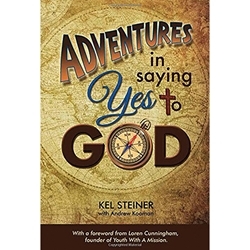 Get ready for Adventures in Saying Yes to God! "What an adventure. What a life. What a refreshing and uplifting book. I could not put it down. Kel's amazing story will help you to dream again. There are Godly ambitions almost forgotten in the hearts of many believers. If you want a guide to a higher, more joyous future, this book is a good place to begin."